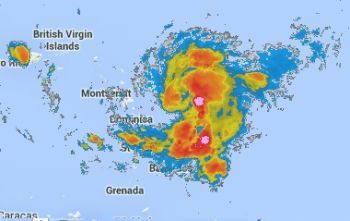 ROAD TOWN, Tortola, VI - A tropical storm (TS) warning and hurricane watch have been issued for the Virgin Islands by the Antigua and Barbuda Meteorological Services, upgrading from the tropical storm watch issued earlier today October 12, 2014. According to a press release from the Department of Disaster Management (DDM) issued this evening, a hurricane watch means that hurricane conditions are possible within the watch area. “A watch is typically issued 48 hours before the anticipated first occurrence of tropical-storm-force winds, conditions that make outside preparations difficult or dangerous,” it said. “A tropical storm warning means that tropical storm conditions are expected somewhere within the warning area, in this case within the next 24 to 36 hours,” it said. It said that the combination of a tropical storm warning and a hurricane watch means that forecasters expect tropical storm force conditions to affect the islands. 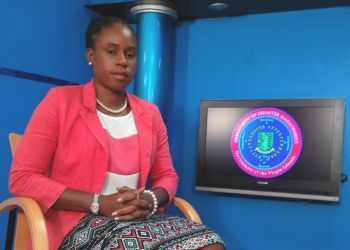 “However, because of development of the system, it could become a hurricane before it gets to our area and therefore, a hurricane watch is issued as a precautionary measure to ensure that persons are preparing for possible impact at the hurricane force level,” the release said. At 5:00 p.m. today, Tropical Storm Gonzalo was located at 16.4 degree north, 58.7 degrees West or 160 miles East-Southeast of Antigua and Barbuda. Maximum sustained winds 45 miles per hour with higher gusts. Movement is to the west at 12 miles per hour. Tropical Storm force winds extend out to 60 miles. Minimum central pressure is 1004 MB. The release said that Tropical Storm Gonzalo will move through the Virgin Islands and Puerto Rico on Monday, bringing with it periods of moderate to heavy rainfall and tropical storm force winds. Gonzalo is expected to become a hurricane by Tuesday. Speaking to this news site this evening Information and Education Manager of the DDM Philomena N. Robertson said that during the day tomorrow October 13, 2014, consideration will be given to the activation of the National Emergency Operation Centre. ROAD TOWN, Tortola, VI – The Department of Disaster Management (DDM) has this afternoon October 12, 2014 announced in a press release that the Antigua Met Service has issued a Tropical Storm Watch for the Virgin Islands for Tropical Storm Gonzalo. “At 1:30 p.m., the National Hurricane Centre has upgraded Invest 90L (Disturbance 1) to Tropical Storm Gonzalo. This follows newly acquired data from a reconnaissance aircraft that indicated the disturbance has developed into a tropical storm,” said the DDM release. According to the release, Tropical Storm Gonzalo is located 16.4N, 58.4W or approximately 230 miles east of Antigua. It said that its Maximum sustained winds are 40 miles per hour. Movement is to the West at 10 miles per hour. Minimum Central Pressure is 1009MB. “The Antigua Met Service has issued a Tropical Storm Watch for the [Virgin Islands]. A tropical storm watch means that tropical storm conditions are possible within the watch area...generally within 48 hours,” the release said. The release said that the environmental conditions are quite favourable for the storm’s intensification. “Therefore, forecasters expect Gonzalo to intensify to a moderate tropical storm prior to moving through the Leeward Islands in about 24 hours. It likely will be a strong tropical storm by the time it reaches the Virgin Islands and Puerto Rico,” the release said. “Forecasters have indicated the possibility of Gonzalo becoming a hurricane prior to reaching Puerto Rico in about 48 hours. By the end of the week, Gonzalo has the potential to be a significant hurricane near or in the southeast Bahamas,” it said. “Residents of the [Virgin Islands] are urged to make the necessary preparations in the event the system is further upgraded,” the release said. 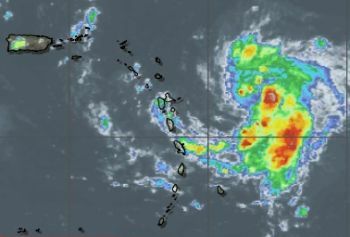 “Forecasters are saying that associated with this system the Virgin Islands can expect a lot of rainfall so persons should therefore be mindful of the possibility of flooding. We’re more than halfway through the hurricane season so persons should continue to be in a state of preparedness and have their disaster supply kits ready,” she said. The word is These and not Deeds. Go and learn to spell. just like how you have one eye you have half a brain that can't spell. Yall have no damn life.. quick to gang on a lil error.. Shi* man!! Ignorant effers! Appears as though you might have an issue, not with misspelling, but misuse of words. May we come through unscathed. Amen. We need the rain, and the wind. Let it rain, Let it rain. @ father..I agree, so everyone please be careful and take anything outside that might fly away, inside. Flood area should be prepared. @ Me. Sorry, I hit the dislike button in error. I am agreement with your post. You are such a moron. I bet if you get dirrhea, it's the NDP's fault too, right dumdum? ?